Engler's original article appeared in the April 2001 issue. If you don't have that hack issue, we've posted this article on our web site at popwood.com. When you get to our home page, click on "Select Articles," on the left-hand side of the screen and scroll down to the article titled "Sawing Plywood and Particleboard." 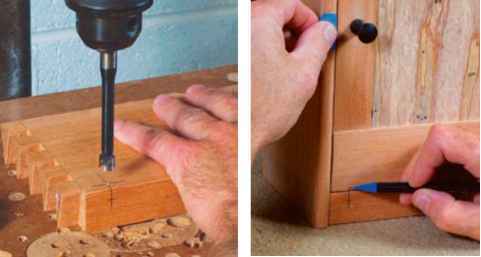 I've built many cabinets using this simple jig and highly recommend it. I built this project using biscuits and a ^"-thick back, which makes the case quite rigid. Another possible approach is to screw the fixed shelves in place through the side pieces using x 2" screws. If the sides of your bookcase aren't going to show or you don't mind the look of plugs, this is a solid way to make a bookcase. First cur the biscuit slots, then cut the pocket holes on the underside oi the shelves. Glue up the case and then drive the screws home. The biscuits line up all your joints perfectly, and the screws allow you to do this without any clamps at all. 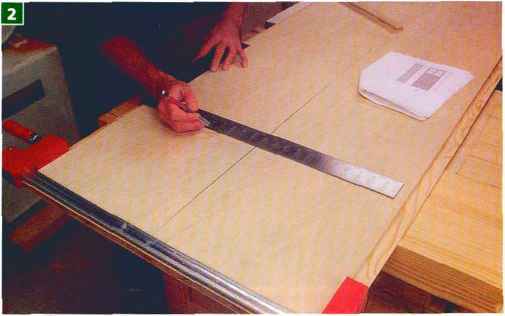 Begin by cutting the big 1 'A" x V2" back rabbet on the back edge of the sides. 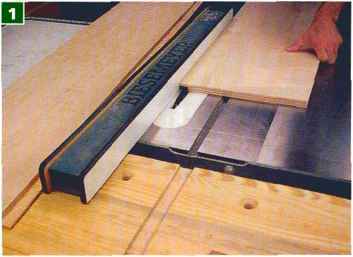 The most accurate way to make this rabbet is by using a dado stack in your table saw. Make a few passes and be sure to keep even downward pressure. 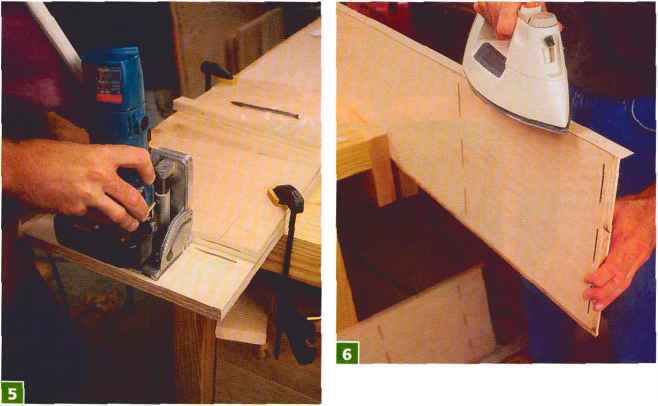 To lay out the location of your shelves, clamp the two sides together. Use a framing sguare to mark the shelf locations. Use the drawing to lay out the locations of the fixed shelves, and the top and bottom pieces. 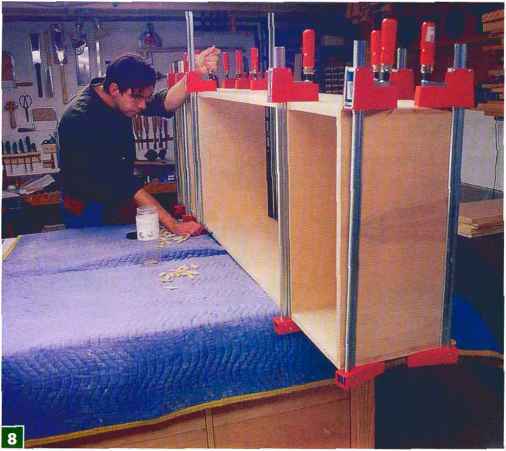 All the permanent shelves are attached to the sides using biscuit joints. Clamp the shelves where they will join the sides. 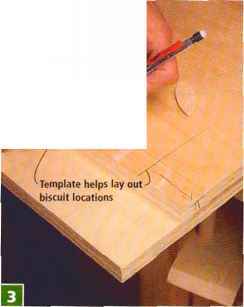 Then make a simple template to lay out the locations of yout biscuit slots. This saves a lot of measuring. Take the fence off yout biscuit joinet fot retract the tool's fence fully into the fence assembly). Cut three biscuit slots in the shelves. I used #10 biscuits because I was out of #20s. Iron on some adhesive edge-banding to cover all the visible plywood edges. Use a household iron set on "high." When the glue is melted, take the iron off the tape and use a sizable block of wood to rub the edging down. The wood acts as a heat sink to cool the adhesive and set the edge-banding in place. Now turn the biscuit joiner on its head and cut the slots in the side pieces of the cabinet. 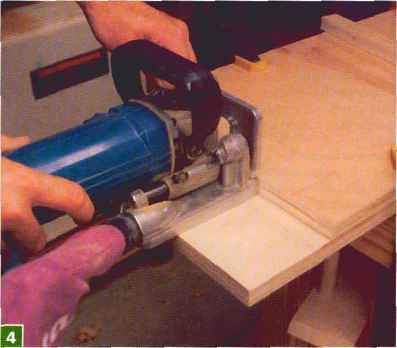 Keep pressure against both the side pieces and shelf. 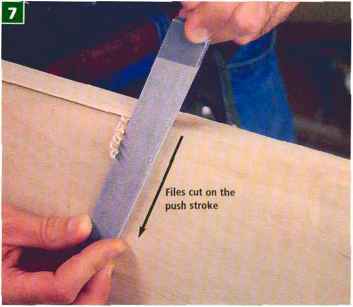 Use a file to trim the overhang of the edge-banding. Remember that files cut only in one direction. Move them the other way and they'll cut poorly and dull quickly. Now sand all your parts at 150 grit and then 220 grit. Always do a dry run before gluing up your case. Once you're sure everything works, use a slow-setting glue. I have become quite fond of the Titebond Extend glues. They are very strong and give you just enough working time to get a big case together by yourself. Once the glue is dry, cut the back to size. You want a perfect fit because the back will keep the cabinet square once it's screwed in place.